Life goal: find ways to make pasta more healthy. I could seriously eat pasta for every single meal, but know that I shouldn’t! 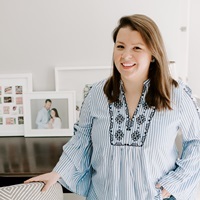 Salt for Life and their team challenged me and a few other bloggers to come up with healthy recipes featuring a few key ingredients (like our own version of Chopped!). This is my second recipe in the series, check out the avocado-toast appetizer I created for my first recipe. So how do you make pasta more healthy? By packing your dish full of tasty vegetables to offset some of those carbs! I recently had dinner at an awesome local restaurant and on the menu they were serving a ravioli dish that combined corn and swiss chard. It was delicious. My mom ordered it but I stole about half of the dish from her, bite after bite. 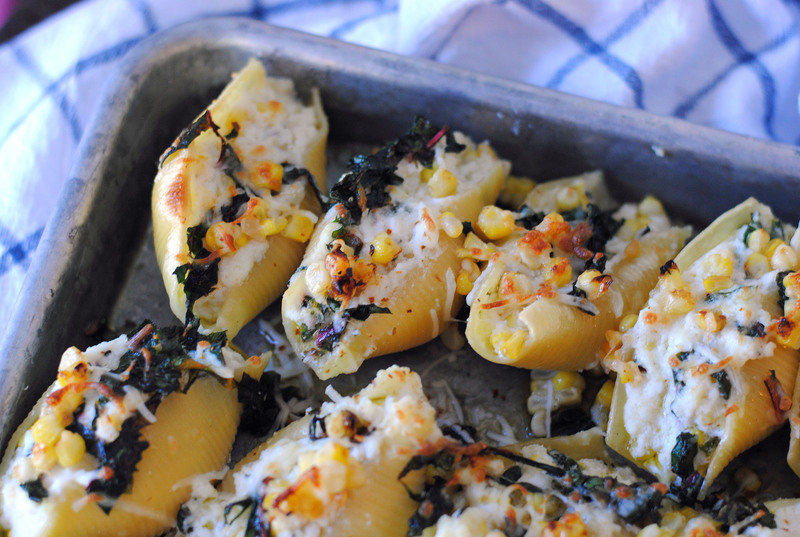 The sweetness of the corn and the bitterness of the swiss chard are a perfect combination, so I decided to add those flavors to a baked stuffed shells recipes. Just a drizzle of olive oil and lemon juice are all you need for the sauce, cutting back on the calories from a rich creamy sauce the dish may normally be served with. 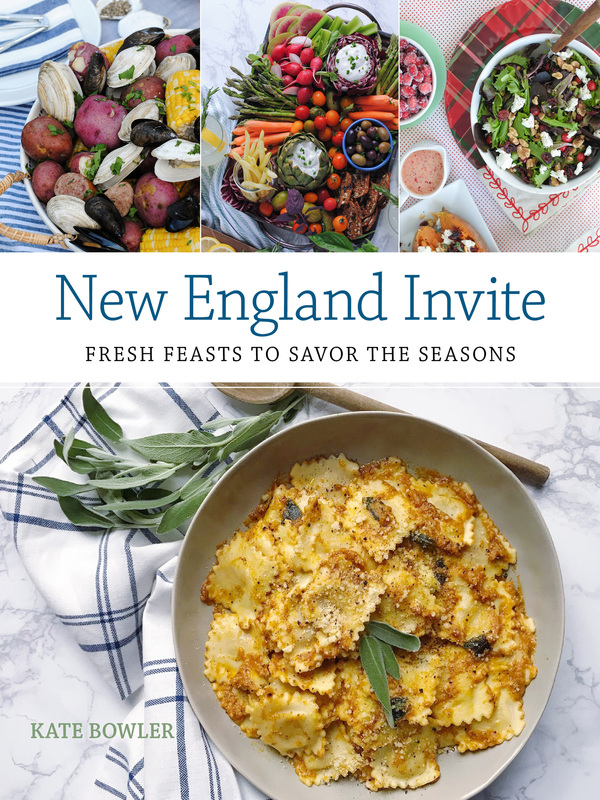 Check out the full recipe below, and be sure to vote for my recipes on Salt For Life’s Instagram page with a “like”! 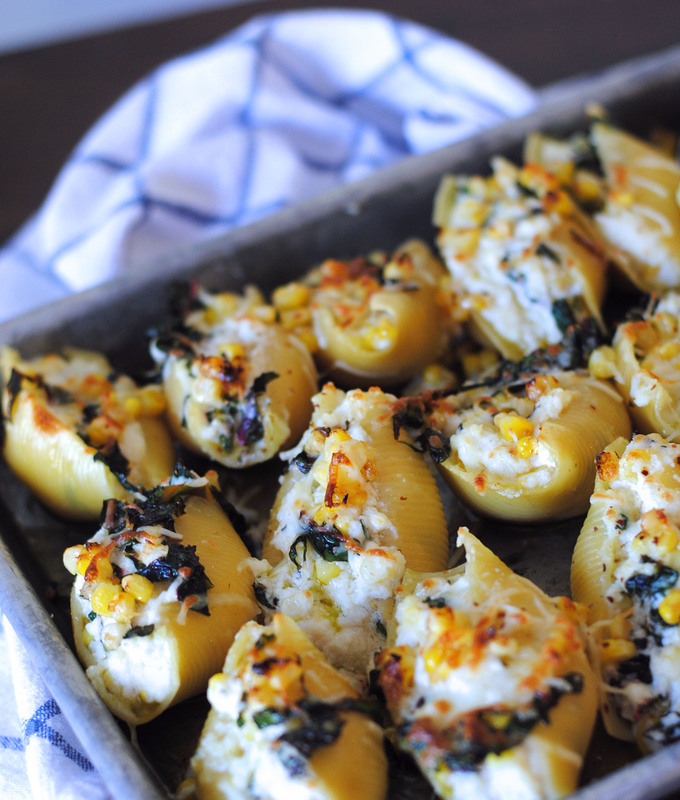 Sweet Corn and Swiss Chard Stuffed Shells. ¼ tsp each of oregano, onion powder, garlic powder, black pepper, red pepper flakes and Salt for Life - combine to make spice mixture. Boil water and cook shells until al dente. Drain and set aside to cool on a rimmed baking sheet. 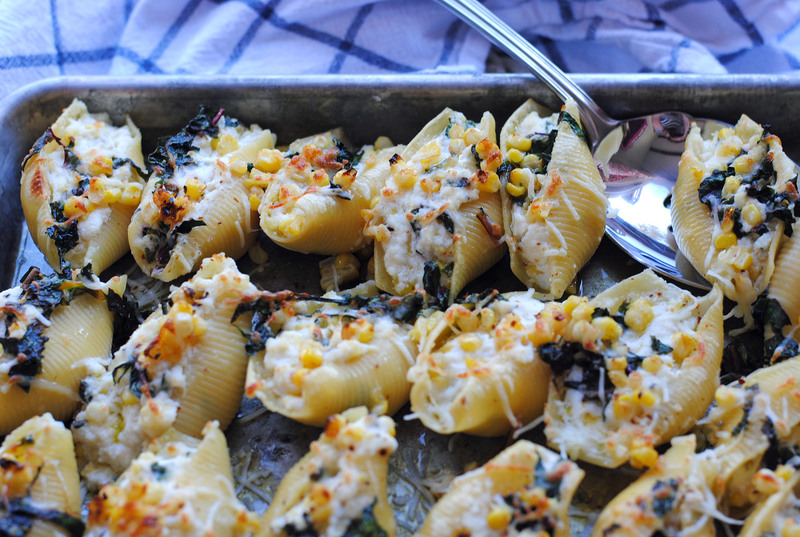 In a large pan, melt butter and sauté corn and chard for 5-7 minutes, set aside to cool. While that is cooking, in a large bowl combine oregano, onion powder, garlic powder, black pepper, red pepper flakes and Salt for Life - combine to make spice mixture. Fold in parmesan and ricotta cheeses. 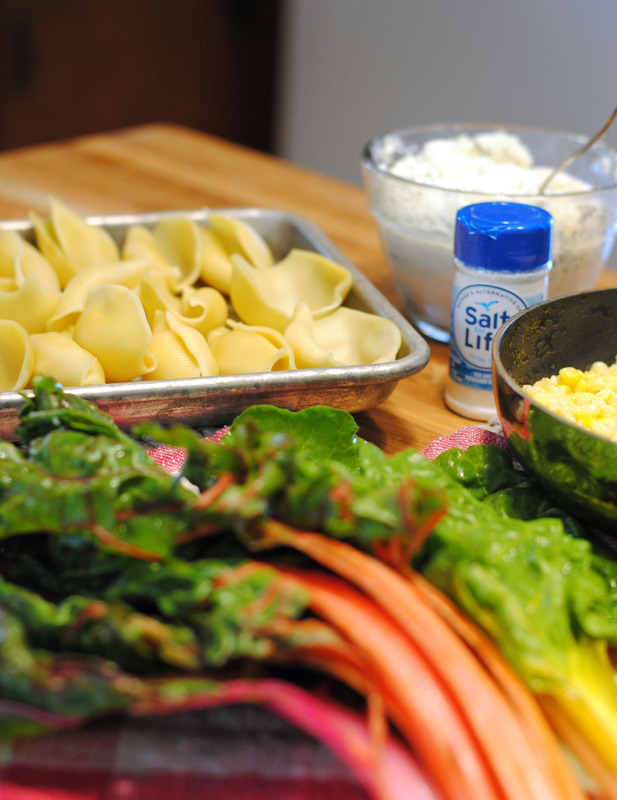 Mix cooled corn and chard mixture into the seasoned ricotta. Scoop ricotta mixture into each shell, filling completely. Line the shells in the baking sheet side by side and drizzle with olive oil and lemon juice (optional, add shredded mozzarella to top). Bake in a 350 degree oven for 17-20 minutes until the cheese is melted and bubbling. Top with more olive oil if desired before serving. California Bruschetta Bites. Grilled Steak Skillet Nachos. 2 Responses to "Sweet Corn and Rainbow Chard Stuffed Shells." You are so creative Kate! I’m forever in awe of your recipes. Curious. I’ve never had chard (BTW is “all” chard Swiss chard or is Swiss just a version) I’m also not familiar with the taste – is it similar to kale as you mentioned bitter. I’ll still take a gamble of trying this out, but thought I’d ask. And last Q – is 1/5 C of Ricotta Cheese above correct or is it 1/4 or 1/2 – Trying to figure out how to measure the 1/5 – or maybe it’s just a heaping 1/4 Cup. I’ll share my results… after trying. Hey! It’s actually 2 cups of ricotta, thanks for catching that. You could use swiss chard, rainbow chard, or even kale or spinach if those are things that you have in your fridge — any leafy green will do, the bitterness of the greens is a good compliment to the sweetness of the corn! Good luck with the recipe.